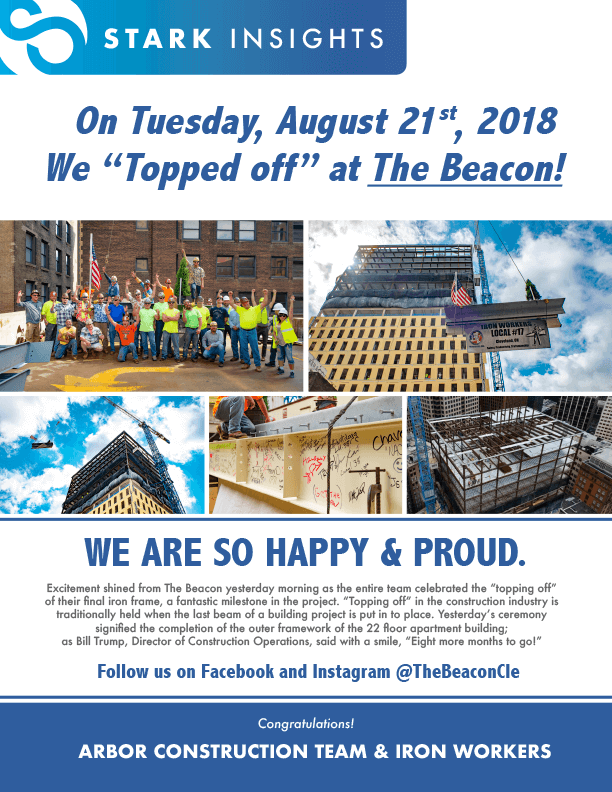 Stark Enterprises’ Arbor Construction and the Iron Workers Local #17 team recently celebrated a major milestone at The Beacon project on 515 Euclid Avenue. This past Tuesday they celebrated with a “topping off” ceremony as they put the final piece of iron in place on the southwest corner of the building’s 22nd floor. This traditional ceremony marked the completion of the outer framework of the structure, paving the way for the last eight months of construction. The Beacon is set to open in May 2019, follow our progress and learn more about the property at thebeaconcleveland.com or on social media. View the press release below or click here to download.